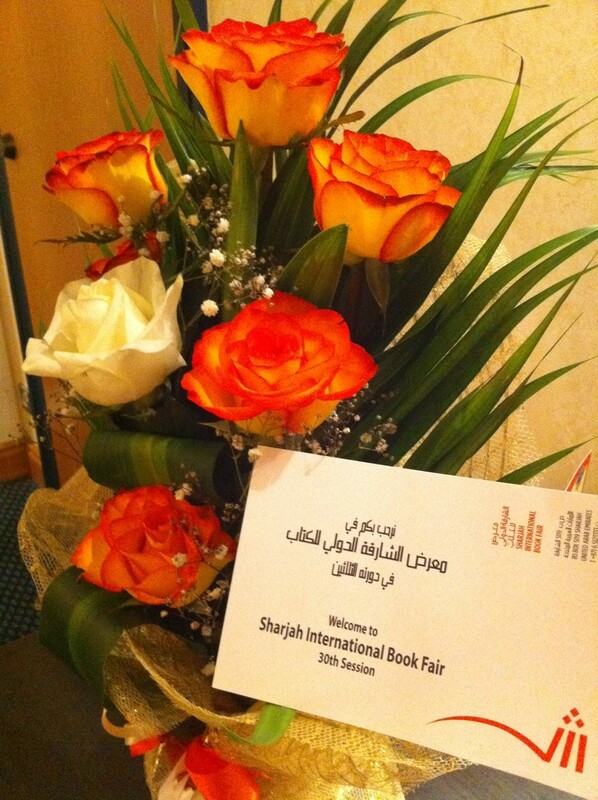 My first full day in Sharjah involved a trip to the ExpoCentre, where the Book Fair is held, and the chance to meet up with faces both new and familiar. It also involved having a proper look at these welcoming roses left for me in my hotel room. Edinburgh writer Sophie Cooke had flown out a day ahead of me, so we caught up on her previous evening at a special dinner in the desert for international delegates. 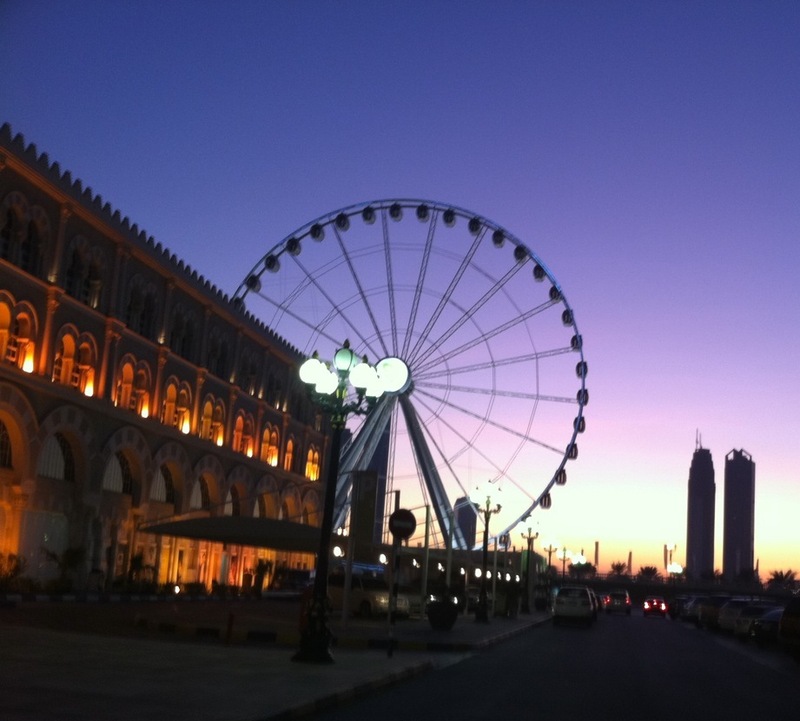 I was jealous, but it seems I’ll get the chance for camel riding and henna art on Thursday evening. 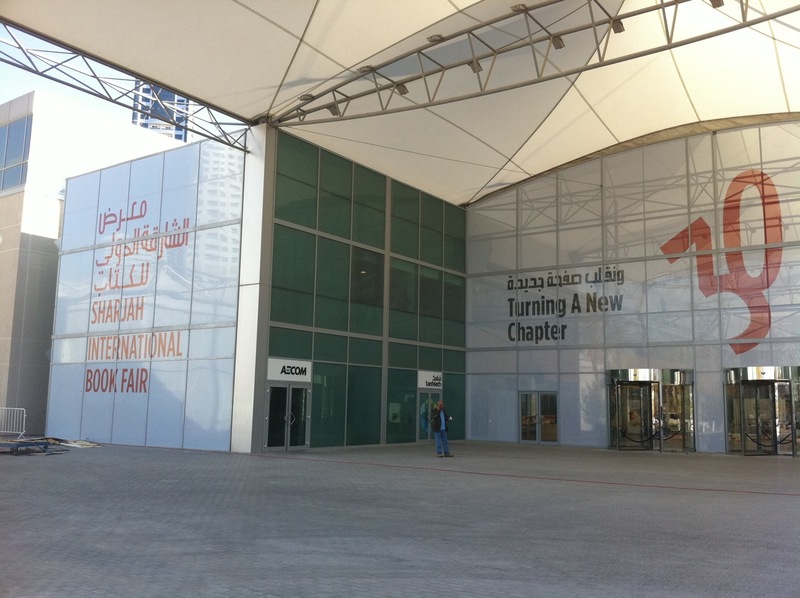 The Fair itself wasn’t open to the public yet, but the professional programme was underway, with SIBF hosting it’s first Rights Fair for international and Arabic publishers to buy and sell foreign language rights to their books. While the session was not as militarily planned as trade events like London Book Fair, there was a much more friendly atmosphere, and it was clear from the buzz and busy tables that quite a number of deals were being done. Sophie met with Liv Stones from her literary agency (whom I bumped into last night), while I searched out Rupert, our host here at the fair and the voice behind the @ShjIntlBookFair tweets. Rupert and I worked together to bring across and group of delegates to represent Edinburgh and learn about the Book Fair here in Sharjah. Over coffee at al Qasba, a promenade on the (man-made) canal, he gave us some background about the Fair, while the sun went down behind the Emirates Eye ferris wheel and the musical fountain danced. It really did dance – the water gave us some dashing choreographed numbers to both Arabian music and an Irish jig. It was somewhat surreal, but rather splendid. Dinner was served to us at the Museum of Islamic Civilization, where we toured some of the highlights of the collections. 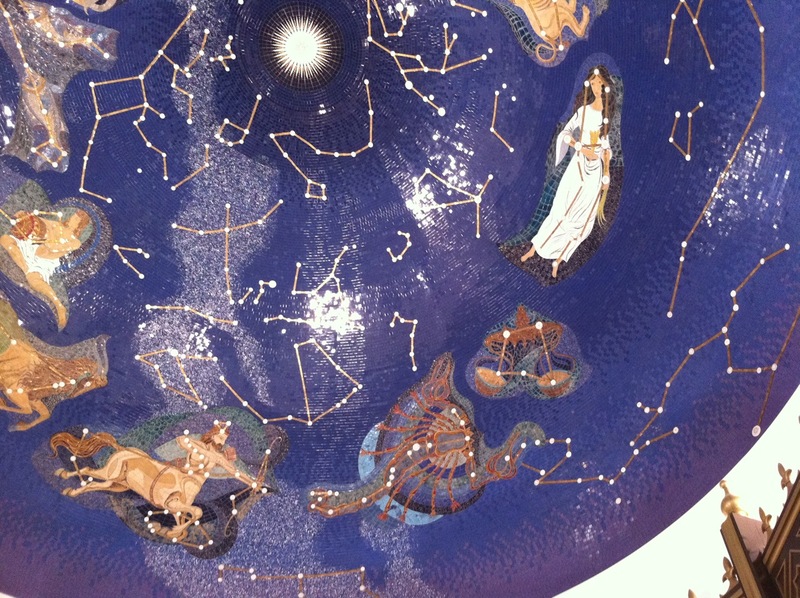 I kept being drawn by the heavens: firstly, I found a stunning set of old astrolabes, used for measuring the positions of the stars, and then I was shown this mosaic ceiling of the zodiac signs. 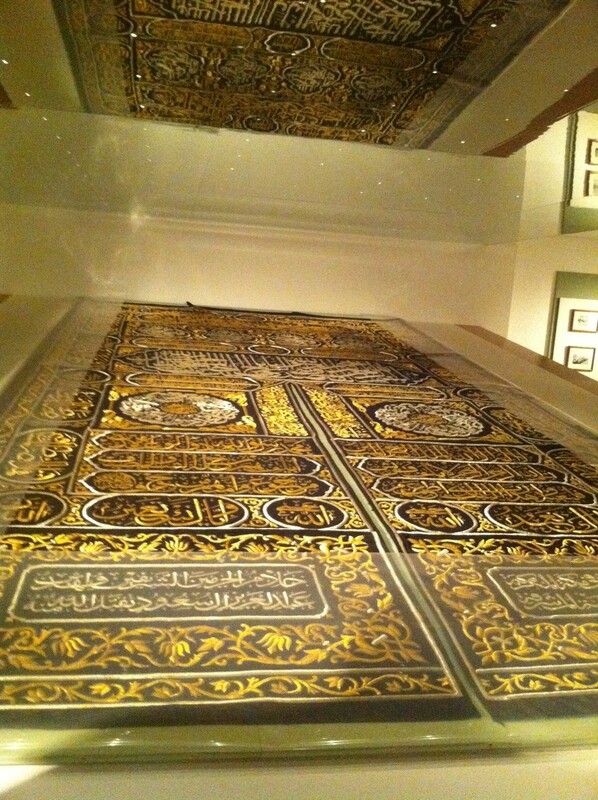 We were shown a number of beautiful religious artefacts, including this section of the Kiswah, the heavy and ornate black silk that decorates the Ka’ba in Mecca. As Sharjah is a dry emirate, a number of the publishers were planning an escape to find a bar over in Dubai: I escaped to bed. In the middle of the night a text message arrived – two more of my Scottish colleagues had arrived at the hotel. In the morning, our Edinburgh delegation would reach four, with the arrival of historical novelist Sara Sheridan and former Edinburgh International Book Festival Children’s Director Sara Grady.